Oh my, it’s May! And it’s a very good thing that my friend Ari advised me to start my bathroom makeover after my son’s birthday party. That was two months ago, and I had some delusion that I could get the whole project done in a week – on top of taking care of the kids, going to work, and planning the party itself. 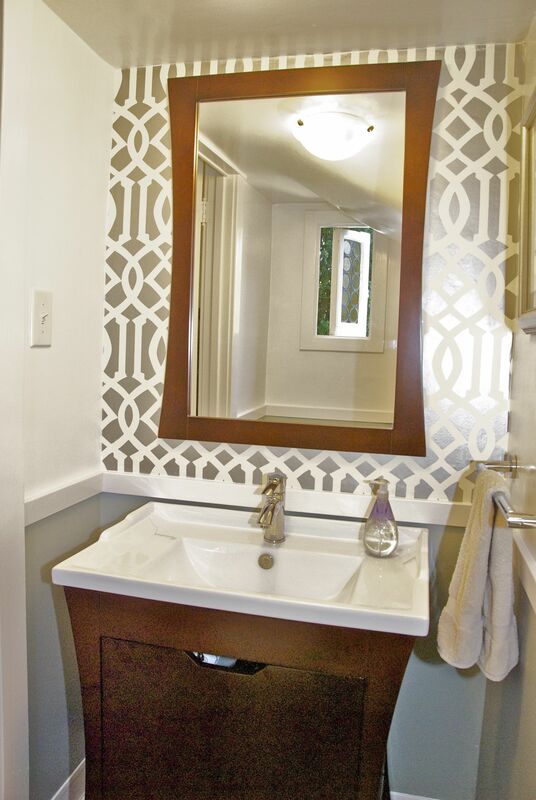 I hadn’t wanted people to see the ugly old powder room at the party, but waiting turned out to the right decision. As they say, good things come to those who finally get their behinds in gear and do some work. I had a little spurt of energy in April, when I put up the wallpaper. Now, I’ve finally added the new trim. I put up a chair rail and used the trick of adding a thin piece of molding a few inches above the existing baseboard to give the illusion of a more substantial baseboard. Adding new trim gives your room architectural detail and makes it feel more elegant and finished. For both the chair rail and the baseboard extension, there aren’t standard shapes, so pick something that you like. I picked a heavier piece with a slope for my chair rail and a very thin piece for extending the baseboard. I get almost all my home improvement supplies at our local hardware store, Papenhausen. I love that I can walk there, and the staff is always friendly and knowledgeable. In a relatively small space, they have just about anything you could need. This time, however, I did end up at a big box store to get a wider selection. It’s almost endless! 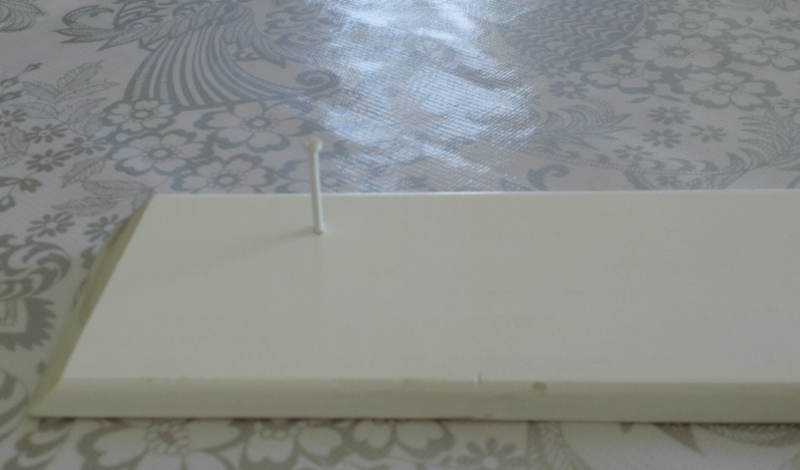 Left: small trim piece used to extend the baseboard. I think this is called “stop” molding. 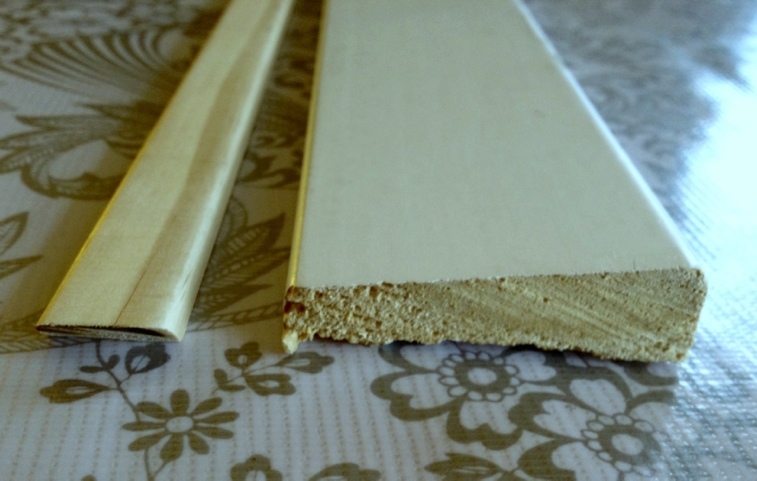 Right: heavier trim piece used for a chair rail. This piece was pre-primed. Measure each wall. If you have an old house like ours, measure at the exact height you will mount each piece, since the walls may not be even. Chair rail is usually mounted 36″ +/- 2″ from the floor. I picked the height of the baseboard to avoid some plumbing. A lot of older and more expensive homes have high baseboards, so this is a great trick to mimic that look, without using a lot of trim, since you’ll just be painting the wall between the old baseboard and the new trim all one color, so it looks like a single tall piece of molding. You will need a way to make miter cuts (cuts on a 45 degree angle). If you have a table saw, follow the instructions for using that. If not, you can use a tool called a miter box along with a handsaw. 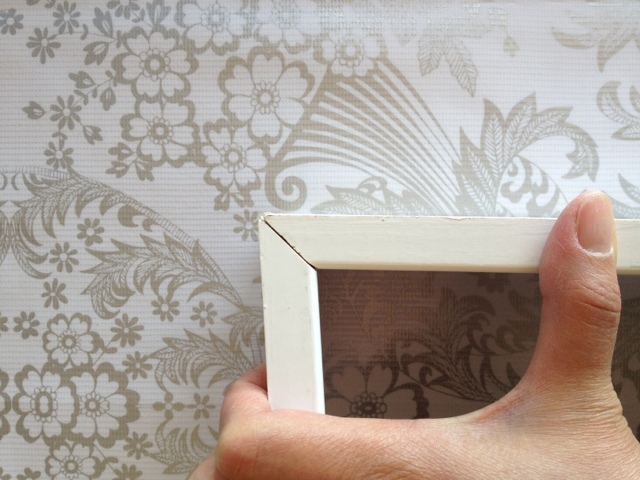 Cut the trim into the lengths you need, with mitered ends at each corner. DO NOT miter the ends that will meet that meet the door jamb, as these should be flush. Yes, I made this mistake – I must have been to0 excited about figuring out how to use the table saw. Cut the trim pieces at 45 degree angles at the corners. 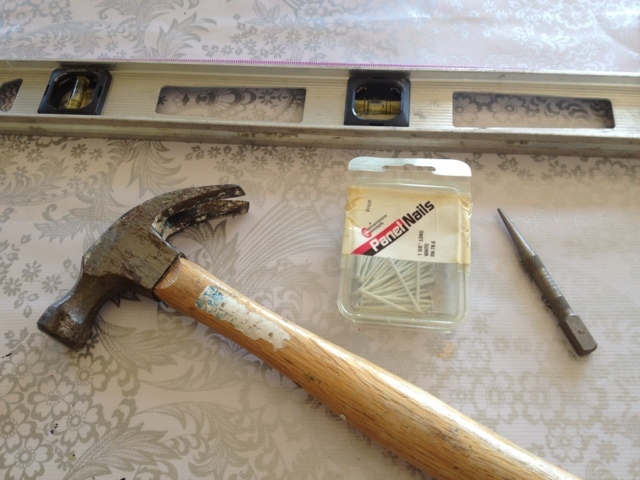 Mark a level line and nail the trim in place with panel nails. You can hammer the nails partway into the boards before nailing them into the wall. That makes it feel less like you need three hands! Once the boards are installed, countersink the nails, i.e. use a nail set or another nail to push the head of your nail into the board, so it doesn’t stick out. Hammer the nails partway into the molding pieces before installing. Luckily, this step can hide a multitude of errors, and there were a few! 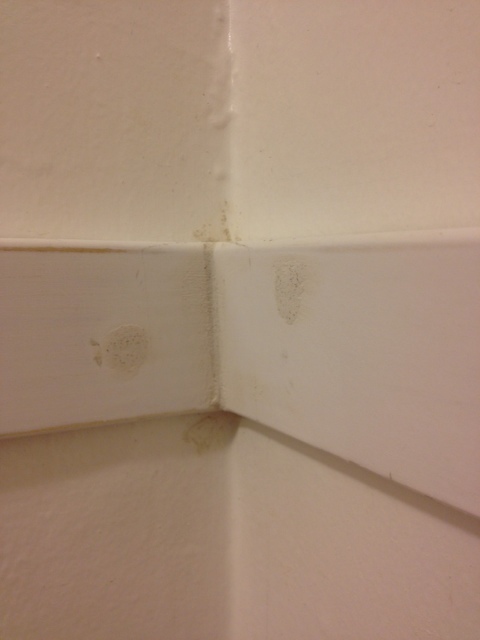 Use wood filler to cover the nail holes and any larger gaps (gaps? What gaps?). Sand the patched areas smooth. 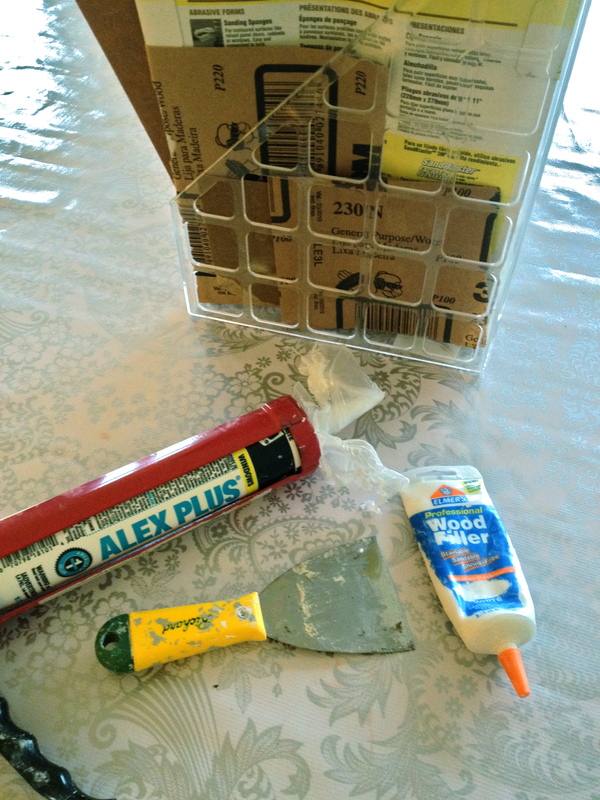 Then use paintable caulk to run a line along the top of the molding to fill the small space between the wood and the wall. 1) sandpaper. I store mine in a magazine file. 2) caulk and caulk gun. You can get ones that you squeeze by hand, too, so the gun is not necessary. Any kind that is paintable is fine. Wood filler used to cover the nail holes and fill the gap at the corner. 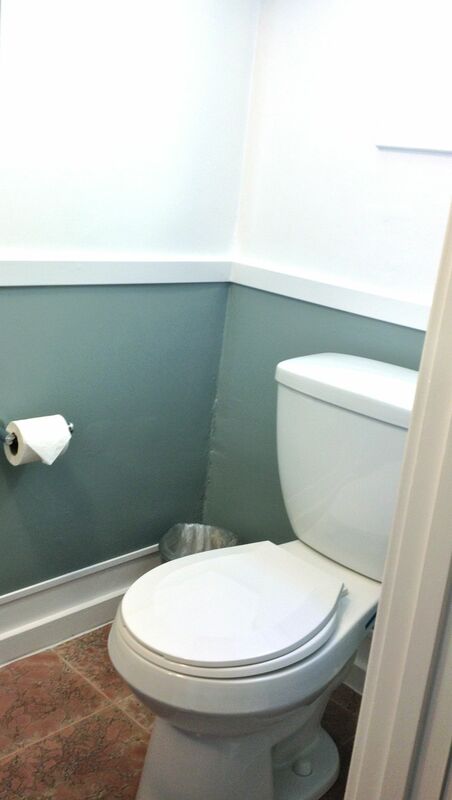 The caulk fills the gap between the new trim and the wall. All the trim is installed. The next step is to prime and paint this area. 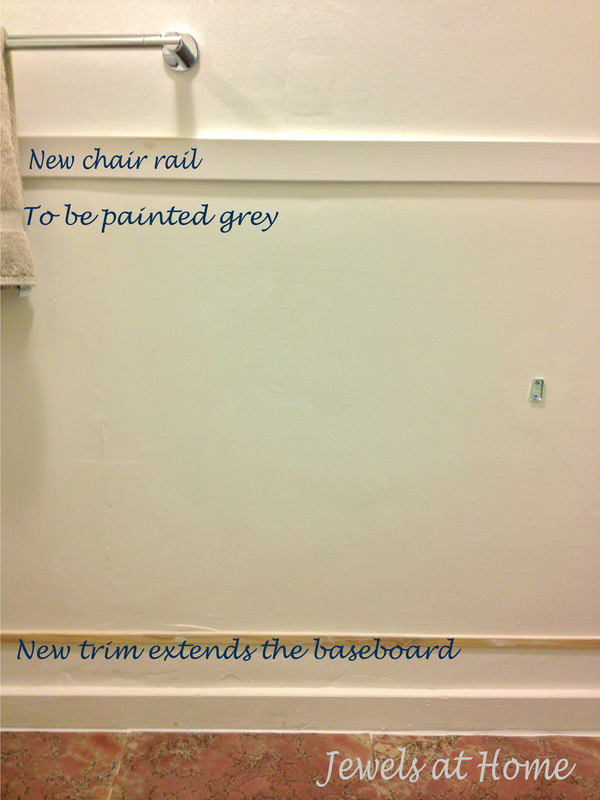 I’m going to use a medium grey on the wall below the chair rail, similar to the inspiration room by Sarah Richardson. The new chair rail and baseboard extension are in place and ready for priming and painting! By the way, I learned how to install trim watching the Christopher Lowell over a decade ago. Did any of you watch him? He did a great job breaking projects down into steps, and he ended every show by enthusiastically saying, “You can do it!”. Those words kept running through my head as I was working! Yay! 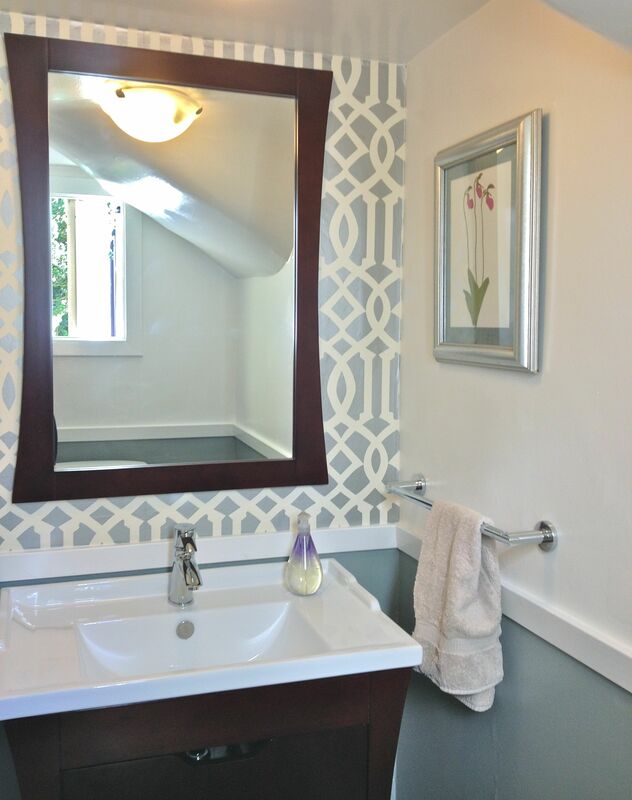 The finish line is in sight for this bathroom makeover. I’m ready to paint, and I’ll call in a plumber to replace the sink with a new vanity. 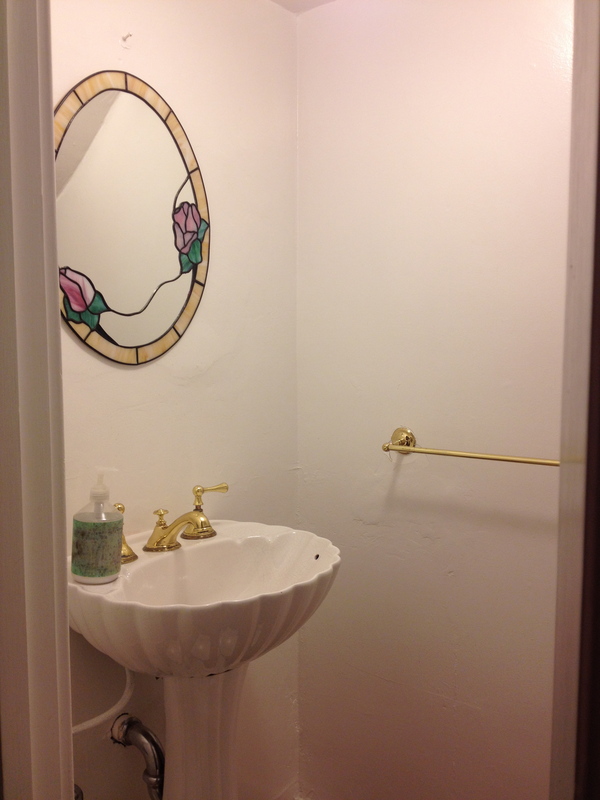 I hope I can post the completed powder room soon. Until then, remember, you can do it! 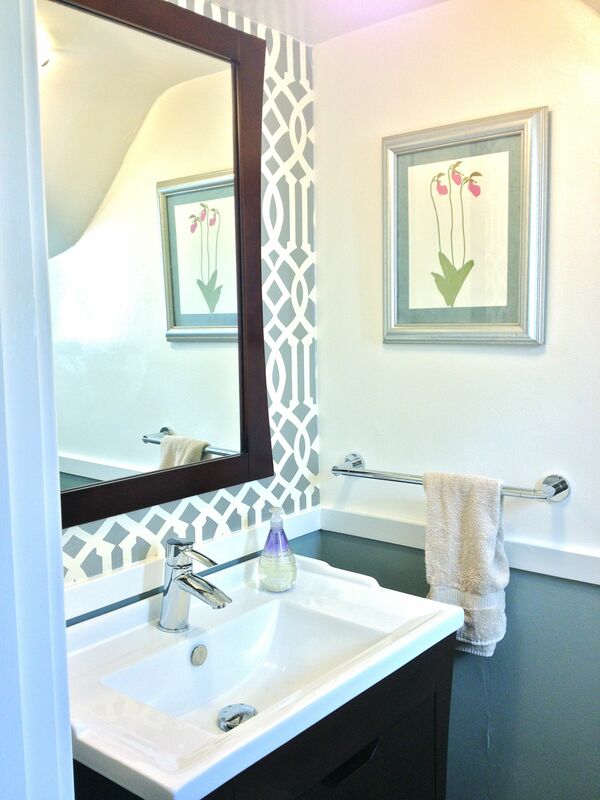 UPDATE: The powder room is finished! You can see it here.